The Kids Korner/Morning Munchins crowd is pictured with the big fire engine that came to visit. 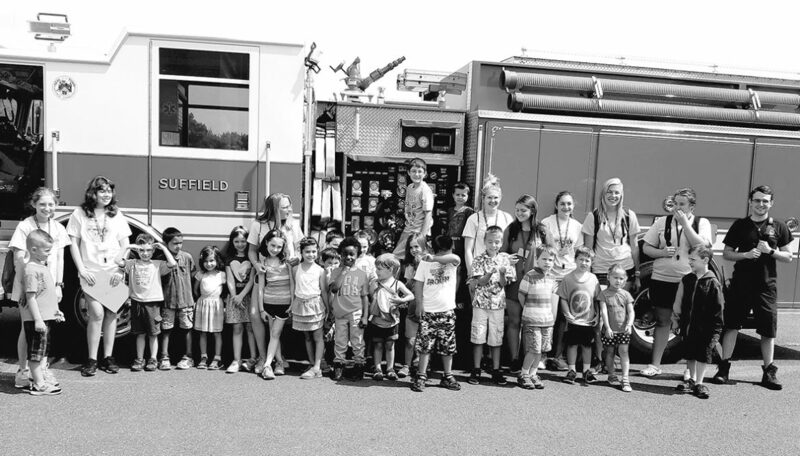 It was an enjoyable summer at the Suffield Parks and Recreation Department with our many offerings for children and families. Campers had a wonderful time while participating in the Kids Korner/Morning Munchkins, Sunrise Day Camp and Tween Camp, Paint It Like Picasso, Crafty Creations, Lego Camps, Minecraft Master Engineering, Splish Splash Art Blast, Once Upon a Cake, Little Einsteins, Kids’ Classic Cooking and Healthy Habits, Tennis, Swimming Lessons, Horseback Riding, Soccer, Softball, Tee ball, Baseball and Basketball Clinics, Performing Arts Theater and the many educational enrichment programs. Join the Bowling Buddies Group! Do you want to get some great exercise and make new friends this fall? Then, join us in our weekly bowling league! The Suffield Parks and Recreation Department’s Bowling Buddies Program practices each Tuesday from October until the end of April at the Spare Time lanes in Windsor Locks from 4:30-6:45 p.m. and is looking for new members and Special Partners, volunteers and coaches. If you would like to participate or be a part of any of our special programs, please contact Donna Carney-Bastrzycki, Special Programs Coordinator at 668-3862. You must pre-register. The group is for ages fourteen-adult. We also go on many fun outings and nights out throughout the year. Sign up and join in on the fun! We also have a new Bowling Buddies Jr. League that begins on October 30th for children in Grades 2-9. Please check the www.suffieldrec.com for registration details. The Bowling Buddies Group visited Mary Adams and Gary Gudinkas’ “On Target-Mini Horse Farm” in Suffield in July. This is one of the most favorite trips of the year for the group. We were able to groom, walk and learn all about the beautiful mini horses. Many thanks to On Target Farm for hosting us again this summer! It’s time to register your daughter for the fall Field Hockey program. This recreational program will introduce girls in grades 2 – 5 to the basic skills and fundamentals of the sport. Girls will learn the proper techniques of dribbling, hitting, passing, various skill maneuvers, as well as basic rules and etiquette. For more info and to register, please visit- www.suffieldrec.com. The registration deadline is Tuesday, September 4. 10K Road Race and 5K Run/Walk! Sign up for the annual 10K Road Race and 5K Run/Walk, co-sponsored by the First National Bank of Suffield! The races will be held on Saturday, September 8. Again this year, we will feature both a 5K Run/Walk! Families and walkers are encouraged to participate in this event. Also, an age 70+ division has been added to both the 10K and 5K events! Both Races will again have early start times to provide a safer route and spectators will be able to cheer for the runners of both races! The 10K Road Race will begin at 8:00 a.m. and the 5K Run/Walk will begin at 8:30 a.m. Then you can plan on heading down to enjoy the Suffield on the Green after the races! Go to SuffieldRec.com and create an account, pre-register and pay by credit card! If you already have an account, simply register and pay with credit card. The pre-registration fee is $25.00 and will end at 12:00 noon on Wednesday, September 5, after which time registration will only be accepted on race day. Race day fee is $30.00. Race day registration starts at 6:45 a.m. at the Suffield Middle School. Both events begin and end at the Suffield Middle School, 350 Mountain Road, Suffield. The races will be timed utilizing antennas above the Finish lines to record the electronic chips. If you are a runner, volunteer or just interested in being a spectator, join us for this great event! For more information and to volunteer, contact the Parks and Recreation Office at 668-3862 or visit www.suffieldrec.com.